Negotiated Double2003aluminium, coatedfont size: 20 cm, 7,9 in. total length: 53,5 m, 2106 in. The British artist Liam Gillick carried out a project title Negotiated Double for the Kirchdorf/Krems federal school centre. In this piece he borrowed a phrase from the French sociologist and cultural theorist Pierre Bourdieu on the subject of neoliberalism which was translated by the artist into a sort of jargon used by young people. In this statement all letters are joined together without any space so that the phrase appears to be one single word. 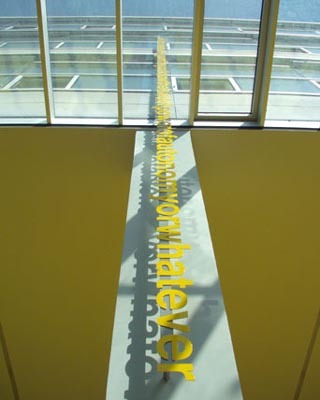 It was installed both horizontally and vertically in German and English on the entrance facade, in the aula and in the stairwell of the school building. In addition, a static clock showing 3:59 p.m. was mounted in the back exit of the building - a time marking the happy moment when even the last pupil has left the school.